Telemetry analysis, datamart, trap speeds, splits ... get it! You're always looking for another second on the iRacing track, trying to squeeze the last few drops of speed out of every corner and every straight. iSpeed is built to help you do this. iSpeed can keep vital information in front of you (using visual and audio output) while driving, and will also help you after the fact - finding the best way through a corner, with braking points, lines and cornering speed. iSpeed runs on your iRacing computer - either quietly or actively, and surfaces data through a wide variety of displays (second computer, iPad, iPod, iPhone, Kindle Fire, second computer, etc). Shows time delta compared to best lap (or any history lap - yours or someone else's). Can show +/- speed and deltas for someone else's lap file - while you're driving. Auto-saves your best setups so you don't lose your setup tweaks. Includes a "Datamart" with other people's lap files for you to download / compare with your own (many thousands of laps availble to download - right now - to compare yours against). Customizable "Trap Speed" points, via the Lap Analzyer. Can "Stay on top" of iRacing running in Windowed mode - important data can be "ripped away" from the main GUI and placed on top of iRacing. Can load save files and looking at user input (brake, throttle, steering angle, gear), drive path, and speed. 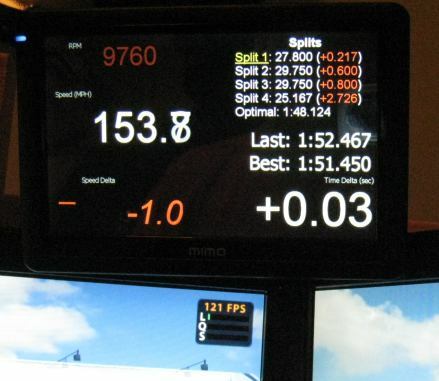 Since we always save your best laps, this makes it really easy to compare against someone else's laps. Download the latest build 3.5.4.0, June 13th, 2017, or view the release notes. Run the file you just downloaded - it will install iSpeed. Launch "iSpeed Telemetry Collection + HUD" from Start -> Programs -> iSpeed. Move the window to someplace useful (like a secondary monitor that won't be used for iRacing), or turn on the web interface and pull it up on your iPad. Run iRacing. Drive. Get Faster. When you're done, load iSpeedLapAnalyzer.exe. Load someone else's lap and compare with yours to see driving input differences (brake points, turn-in point, etc.) and see where you can improve. Read Troy Schulz's "Getting Faster, one second at a time" guide - highly recommended. If you have comments, problems, questions, please post to the iRacing forum. iSpeed is a labor of love, in many senses (and often gets in the way of actual racing!). That said, many features have been added at the request of users, and for that kind of work to continue, there needs to be some incentive to continue working on iSpeed. That's where donations come in to play. For any user that donates $15.00 or more to iSpeed, you'll get a license key, which disables all the "Please Donate" requests in the software. Using one of the "Money" buttons will automatically generate you a license key. You'll also get priority support and a special email address to use to contact us if you have any questions. Converting an iRacing replay to an iSpeed lap. Adjusting iSpeed voice announcement volumes. Troy Schulz's "Getting Faster, one second at a time" guide - highly recommended. Lost your donation / activation key? Enter the email address you used when you originally donated. Your key will be automatically emailed to that address. If your email address has changed, contact codes@nessoft.com to have this corrected so we can get your license key sent to you. We also do network troubleshooting tools. If you're having problems with latency, lag, packet loss and similar, please try PingPlotter. We even have a knowledge base article on how to use PingPlotter with iRacing.